This is something I tried after reading the recipe from a magazine. The final result was really good and really new taste and most of all my girls like it :). Here is the recipe. 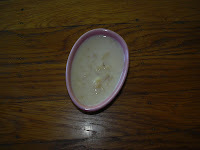 Soak the dates in milk for half an hour. Grind it (with milk) coarsely and keep it aside. Now take a pan, put sugar and grounded dates and mix both well. 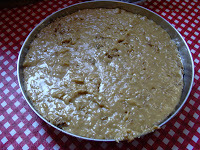 It will become a thick paste (like Chakka Varatti) Remove it from the stove, add the chopped walnuts, ghee and mix it well. Let it cool. Make small balls (in cylindrical shape) out of it, sprinkle the coconut on top of it (or we can even roll it the shredded coconuts) and keep it in the refrigerator for 3 to 4 hours to let it set. After 4 hours, take it out and cut it into small pieces and enjoy. This is really a kids friendly snack. Try it. This is a recipe I learned from one of my aunt who lives in LA. It is very healthy and it reduces the intake of more carbohydrates. Just check out. This is my favorite sweet. My MIL used to make it very often and she is very good at it. This time, I learned the recipe from her. Even though it was not professional like hers, it came out very well. Here is the recipe. First add baking soda to the butter and whisk it for few mts. You will see bubbles forming. 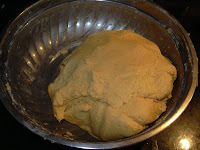 Now add the flour to it and make it a soft dough adding required amount of water. Keep it aside for few mts. In the mean time, put the sugar in a heavy bottomed skillet, add a cup of water and make it a semi-thick syrup***. Add pacha karpooram to the sugar syrup and mix it well. In the mean time, pre heat oil and make small patties out the dough and deep fry it till it becomes golden brown keeping the heat in medium flame. Put the patties in the sugar syrup and soak it well. Remove it from the syrup and put it in a vessel. 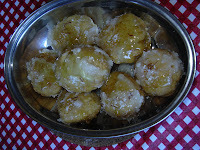 Now pour the remaining syrup on top of each badusha and garnish it with coconut. 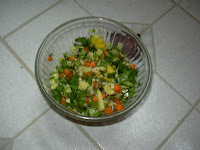 This is my all time favorite savory and my mom used to make it very often because, omam is good for digestion. I usually buy this stuff from Indian grocery. This time I wanted to try making this so I asked the recipe from my patti and it came out really well. Here is the recipe. Mix all the ingredients and knead it into a soft dough adding little by little water. Heat the oil in a heavy bottomed pan. 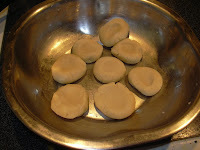 When the oil is ready, make small balls out of the dough and pass it to the oil through Omapodi naazhi. Fry it till golden brown. 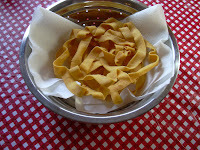 Remove extra oil in a paper towel and enjoy!! This can be stored in an airtight container for more than 10 days. This is another savory treat I make very often. Even though many of us know the recipe, this is my version. Heat oil in a heavy bottomed pan. In the mean time, mix all the above said ingredients, sprinkle water accordingly and make a smooth dough. Once the oil is ready to fry, make small balls out of the dough and pass it in the oil through pakoda naazhi. Fry it till becomes golden brown, strain the excess oil in a paper towel, let it cool and store it in a air tight container. This post goes to Priti's Diwali Celebrations. Lets Start the diwali postswith a sweet. The name of the sweet is 7 cups cake. The necessary ingredients are as follows. Pre-heat a wide pan for a minute, add all the above said ingredients and stir it thoroughly in a steady steam. Continuously and thoroughly stirring, cook until the ghee starts to leave the sides of the pan and the mixture starts to thicken and turns to kind of semi-solid and light gold in color. 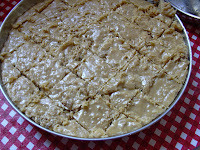 Immediately pour it in a big greasy tray or plate and cut it into squares or diamonds whichever shape you want. When it is still hot, we can decorate each diamond or square with a cashew or almond. It will taste more like mysore pak. But the main difference is, we are adding coconut and milk in this receipe. It will take 20 minutes to finish this receipe and the kids will definitely love this. I usually don't decorate. If you wish to do it, you can do it. I personally don't like tindora. I make the curry for my husband who likes it very much. This is something I tried after getting the recipe from my MIL. Here is the recipe. Pressure cook tindora upto two whistles (do not overcook) and keep it aside. Now take a pan, pre heat oil, add mustard, urad dhall and cumin seeds and let it splutter. Now add the chopped onion, garlic and ginger and saute' for a minute. Add chopped tomato to it and mix it well and let it cook for another 3 mts. Add water if necessary. Add turmeric powder, garam masala powder and required amount of salt (for both tindora and masala) to it and mix it well. 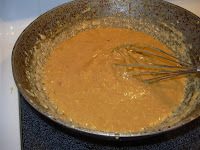 Now add the cooked tindora to it and mix everything well. Stir it till water is fully absorbed. This can be used as a side dish for rice and also for chapathis. 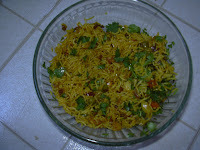 I made this as a side dish for chapathi. It was really good and even my girl's like it too. Fry these masala ingredients except coconut in a pan with a drop of oil, to golden brown and grind it. Excess powder can be used later. For the above said ingredients, we may need 2 or 3 tbsp masala powder. Now take the required amount of masala powder and add coconut to it and now grind it finely. Now in a pressure pan, pre-heat 2 tbsp ghee and oil fry the seasonings to golden brown now add all the vegetables to it and stir it for a minute. After a minute, add rice and toor dal to it. stir it for 1/2 a minute. Let it mix with the vegetables. Now add water in the ratio of 1:6. So we need 12 cups water. Add turmeric powder, Sambar powder(optional), asafoetida powder and masala powder(with coconut) to it. Add salt to taste. Now pressure cook these ingredients up to 7 or 8 full whistles. After opening the pressure pan (after 10 or 15 mts depending upon the pressure), add the remaining 1 tbsp ghee and coriander leaves and stir it thoroughly. Again close the pressure pan for 5 minutes. Now Bisibelebath is ready to serve. 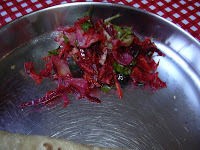 We can serve this Bisibelebath with Onion Raita or/and chips. This rice should be in a semi- solid consistency than normal rice. Some people also add 1 tsp sugar to the rice (before cooking). 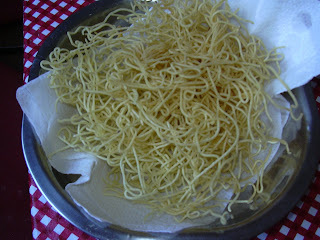 Bisibelebath is a famous receipe in Karnataka. My neighbour in my apartment(from karnataka) taught me this. 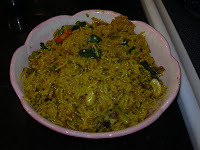 We can also give this rice to kids after adding few more spoons of ghee. Try this and lemme know your comments. 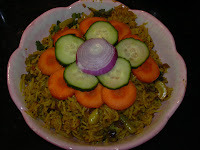 This is a simple receipe for making Carrot Rice. The ingredients are as follows: 1 cup Basmati Rice(or regular sonamasuri rice) Soak it in water for 5 minutes, 1 Big Carrot - chop it, grind it and get juice out of it, 2 tbsp oil, 1tsp unsalted butter, salt to taste, Mustard seeds, urid dal, 1 green chilli, 5 cashews, 5 shredded almonds, pinch of asafoetida, turmeric powder, 1 finely chopped onion, Coriander leaves, curry leaves. Fry these ingredient in a pan with a drop of oil and grind it. Keep it aside. In a pressure cooker pre-heat the oil and butter. 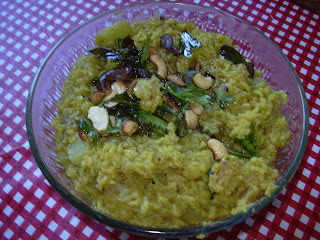 Season the mustard seeds, urid dal, cashews, almonds, green chillies and finely chopped onion to golden brown. Now add the Rice (drain it after 5 mts of soaking), carrot juice in 1:2 ratio(1rice:2juice), 2 tsp masala powder, turmeric powder, asafoetida and salt. Pressure cook this upto 2 whistles. Before serving garnish it with Coriander leaves. Raita can be used as side dish for this Rice. 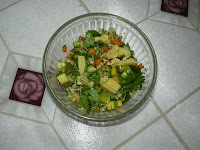 Try this receipe and lemme know your comments. This goes to Srivalli's Rice mela event. Vandhana is hosting Lunch Box special Event. 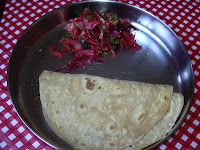 I am sending my Kids Friendly Chapathi to this event which is a big hit with my girls. Since I just started packing their lunch boxes, need more training (!) I believe. But overall they are doing just fine. 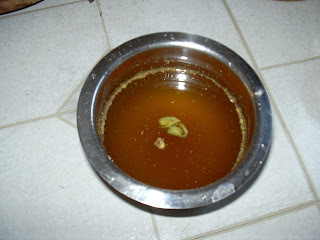 This is a traditional drink we make as neivedhyam on the last day of Navarathri. here goes the recipe. I am sending this entry to FIC - Brown hosted by Sunshinemom. Thanks Shama for letting me know about this event. Most of us know how to make tomato rice. This post is for those who have small kids like me. My girls' like this rice and finish it most of the times. So I call this kids friendly tomato rice. Here is the recipe. Soak rice for 10 mts and drain it. Grind the tomatoes nicely and get the juice out of it. Filter the juice if necessary. Now take a pan, pre heat oil, splutter mustard seeds, add urad dhall, cashew and green chillies to golden brown. Add chopped onion, peas and carrots and fry it till it becomes soft. Now add the drained rice and saute' for another 2 mts. Transfer these ingredients to a pressure cooker. Add 1 1/2 cups of tomato juice (1: 11/2 ratio), turmeric powder, required amount of salt and cook it upto 2 whistles. Turn off the stove and let the pressure release. When the pressure is released, open and sprinkle the asafoetida powder and garnish it with coriander leaves. Serve it hot with onion raita. 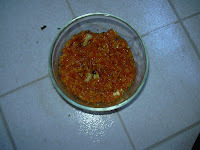 Sweetness from tomato, little bit spicyness from green chillies will make the kid finish the rice without any trouble. My girls like this very much. 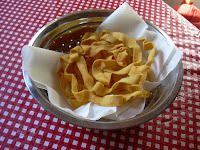 ** - We can also add a teaspoon of ghee while serving. While frying the onion and peas, we can also add a pinch of sugar which adds more flavor to this rice. - Put the logo on your blog. - Add a link to the person who awarded you. 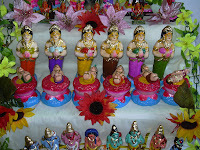 Navarathri - Which is one of my favorite hindu festival. 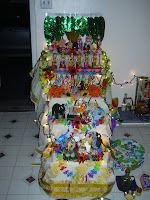 Since I was born and brought up in an Agraharam, we celebrate navarathri in a very grand manner. There were 40 residents in that Agraharam and 36 residents will have navarathri festival. Since I am the only girl in our family, my mom and my aunt used to put costumes everyday like madisaar mami, krishnar, Radha, Ramar, etc. It used to be really fun to visit everyone's place everyday without fail, with all my friends and most of all collecting Sundal is the main part of navarathri for us. 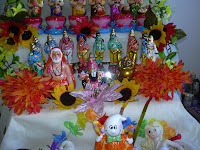 We never bothered to see the decorations people have made or new idols sitting in the padi etc, our goal is to collect Sundal and we work hard (!) to collect maximum. Now a days my girls' miss all those fun. So I try to make whatever I could during these Navarathri days to make them happy and enjoy the festival. I didn't follow any particular theme this year cos one of my twin is sick with viral fever. I just arranged the idols. 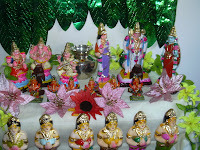 First padi is Vinayakar - Lakshmi - Saraswathi set, and Murugan - Valli kurathi - Deivanai kalyana kolam along with kalasam. Second padi is karthikai Pengal with baby Murugan in lotus flower set. Third padi is Dasavatharam (not kamal's movie) with a small Venkatachalapathy and Ragavendrar (some people believe, he is a avatar of Mahavishnu) and Laughing buddha. Fourth and Fifth padi were arranged by my twin girls. 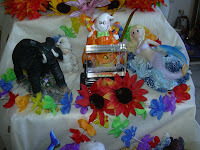 Fourth padi has a tusker elephant, Halloween pumpkin, Mermaid and Newyork skylights. 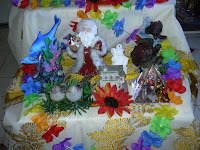 Fifth padi has dolphins, santa, leather back seaturtle, snowman, birds, a small house and Lasvegas Luxor model. My better half is not interested in all these rituals and he doesn't believe in these rituals. So he never bothers to help us out. This is what I made during Navrathri as Neivedhyam. First day started with Simple Vermicelli Payasam . 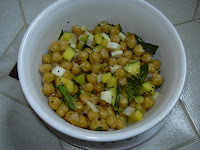 Next day I made Garbanzo Sundal which was really a hit. 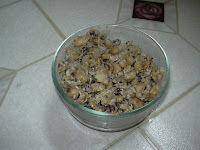 On thursday I made Black eyed bean sundal with Quick Carrot Halwa. On friday, I made Mixed vegetable Sundal with Paal and pazham (milk+banana+sugar) as sweet. 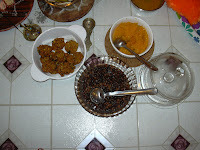 On Saturday, I made , Black Chickpeas Sundal with Oats Vadai and sojji(kesari). On sunday, I had only rice, cos I had to visit friends' place to get navarathri thaamboolam. 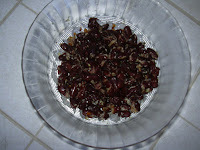 On monday I made Rajma sundal with Pal Payasam. On Tuesday I made carrot halwa and no Sundal(!). On wednesday, I just did the regular cooking with rice and milk as naivedhyam. 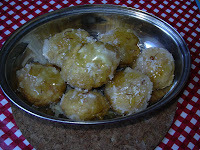 and On thursday, I made paruppu vadai (will write the recipe in detail cos I didn't deep fry the vadai, instead I bake them) and sabudhana payasam as prasadham and finished the navarathri celebrations successfuly. 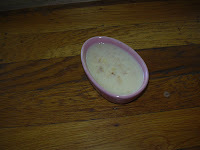 I got the inspiration for making this pudding from Pavani's banana temptation. I added some more ingredients to it. Soak dates and raisins for 10 mts in water. 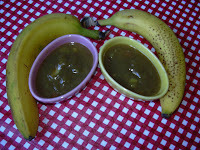 Drain water, put it in a blender along with peeled banana. Smash those and keep it aside. Take a pan, pre heat butter add cashew and almonds and fry it till golden brown. 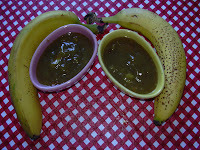 Now add the grounded banana to it, add honey and sugar and mix everything well. Refrigerate it and have it with a dallop of ice cream of your favorite flavor. It was really. Pudding may taste like Panchamirtham!! This is something I wanted to make after seeing Rashmi's blog. I usually make quick carrot halwa with leftover carrots from carrot rice. This time I used fresh carrots to make this halwa. This is the first time I am trying, so I used only one carrot. Here is the recipe I followed. First take a pan, put the shredded carrots, add a cup of milk and let the carrots cook in the milk under medium flame. 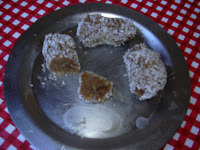 When it is 3/4 cooked, add the remaining milk little by little, add sugar and pachakarpooram and let it cook finely. Now add the ghee on top of it and mix it well. Stir continuously and turn off the stove when everything form like a ball. In the mean time, fry cashews to golden brown and add it to the halwa. Since I added more milk, it taste like a pal therattupal. 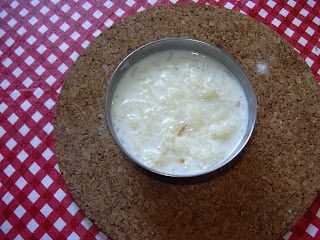 My grandma is very famous in making this payasam in our family. She never uses condensed milk or milkmaid to make this. I strictly followed her recipe today. First wash the rice and put it in a pressure cooker. Add 3 cups milk and pressure cook it under medium flame upto 5 whistles. Make sure the rice is fully mashed. When the pressure is released, open it and add 2 more cups of milk and required amount of sugar, pachakarpooram, cardamom to it and stir it continuously till everything mixes well. It takes 10 mts to get a nice consistency and aroma from milk and sugar. Now add the remaining milk and stir it for another 5 mts. Serve it hot or cold. My grandma never use cashews or any kind of garnishing for this payasam. The taste from the milk itself will be really good. Consistency is very easy - Pour a drop of payasam on your counter top and try to draw a line in the middle with your pointer finger. Now the milk will stand still on both sides leaving a line in the middle. This is the perfect consistency. Turn off the stove immediately when you get this consistency. If its too watery, then the milk will join - it means payasam is not ready. 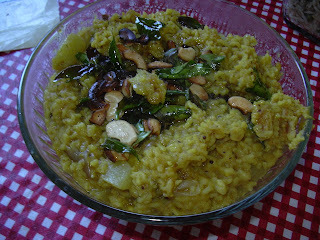 This is something I got the recipe from a magazine and I wanted to try this for Navarathri as sundal (!). It was really colorful and the left over was used as salad. Chop Baby corn and carrots into small pieces. In the mean time, microwave or steam cook the sprouts till it becomes softer. Drain the excess water and add it to corn and carrots. Chop mango into small pieces to match carrots and corn. Add it to the sprout mixtures. Add salt and pepper, lemon juice and coriander leaves and mix it well. Here we can also use green chillies in the place of black pepper. 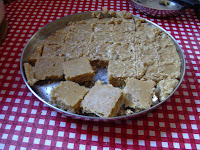 This is another sundal I made during Navarathri. Here is the recipe. Soak black eyed beans for atleast 4 hours. Pressure cook it adding required amount of salt and drain it after opening the pressure cooker. Take a pan, pre heat oil, splutter mustard seeds, add urad dhall, curry leaves, red chillies and asafoetida powder and fry it till golden brown. Now add the cooked beans to it and mix it well. sprinkle the coconut on top. enjoy! !